Pure Power Edge, an innovative mouthguard praised by top pro and amateur athletes, is revolutionizing the way sports are being played. Artisan Dentistry is proud to be a provider of Pure Power Edge mouthguards, an innovative mouthguard praised by top professional and amateur athletes for superior safety and comfort. Pure Power Edge improves flexibility, increases balance, and helps athletes avoid trauma to their teeth in a way never before possible. What’s wrong with a regular mouthguard? 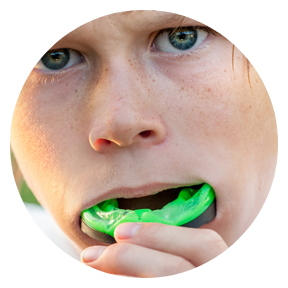 A regular mouthguard is heated up so the teeth can be form-fitted into the mouthguard material. They’re uncomfortable, which is why athletes often remove the mouthguard periodically. Then there is the pressure-heated laminated type of mouthguard, which fits better. However it causes the muscles of the jaw to work harder to keep it in place. That would certainly be distracting during a big game and can cause undue pressure on jaw joints, leading to pain. Pure Power Edge is a comfortable, custom-fitted mouthguard that uses specialized computer technology based on neuromuscular dentistry to isolate and capture your ideal bite position. If you’ve ever found yourself gritting your teeth during times of stress, it won’t surprise you to learn that your bite is connected to your body in a way that influences relaxation. When your bite position is perfectly aligned, the muscles of the jaw are relaxed, and you are too. Neuromuscular dentistry finds the best bite position to ensure relaxation of the jaw. These measurements are translated into a custom-fitted mouthguard that helps you feel stronger, enjoy increased range of motion, and have better balance. Overall, Pure Power Edge gives you the competitive advantage by allowing you to use your body more efficiently. All over the world athletes in contact and non-contact sports are discovering how Pure Power Edge makes a difference on the playing field. If you want the same advantage, please contact Dr. Paul Mathew of Artisan Dentistry in Salem, New Hampshire and Newburyport, Massachusetts to schedule your free consultation.